by Glickman, Carl D., Gordon, Stephen P., Ross-Gordon, Jovita M.
Glickman, Carl D., Gordon, Stephen P., Ross-Gordon, Jovita M.
"I really like this book and my students do too. They all say, it is the one book they intend to keep after graduate school." Helen M. Marks Ohio State University "This text is an engaging helpful resource in teaching students about instructional leadership." Marla W. McGhee Southwest Texas State University This classic market leading text in instructional leadership and supervision continues to challenge the conventional purposes, practices, structure, and language of successful supervision. The text's emphasis on school culture, teachers as adult learners, developmental leadership, democratic education, and collegial supervision have helped to redefine the meaning of supervision and instructional leadership for both scholars and practitioners. 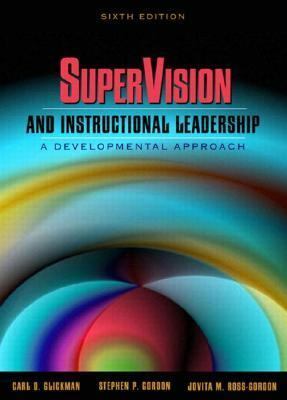 This sixth edition continues the book's trend-setting tradition by placing instructional leadership and school improvement within a community and societal context; providing new examples of direct assistance, professional development, and action research; and presenting an entire new chapter on "Supervision as a Moral Endeavor." Building on the success of previous editions, the sixth edition now addresses hot issues such as school improvements, constructivist teaching, professional development, Chaos Theory, and state mandated standards. This is a resource that students purchase, use in class, and reference throughout their careers as education leaders.Glickman, Carl D. is the author of 'Supervision and Instructional Leadership A Developmental Approach', published 0012 under ISBN 9780205380794 and ISBN 0205380794.